It’s Spring Break for us collegiate-types, and J and I took the opportunity to go South, where it’s 70 degrees, all the flowers are busting out, and family ties await. We found amazing airfare on American Airlines and flew into Atlanta early Friday morning. Since our visit was a surprise, no one could, of course, pick us up at the airport, so we had to take my first-ever Atlanta taxi. Did you know that in Atlanta, the taxis smell like peaches and play classical music??! The driver dropped us off at the end of my street so that we could sneak back up to the house and royally shock my mom. We clambered out of the car and were greeted with an odor that can only be described as funkalicious—the fetid fragrance of the Bradford pear tree blossoms. 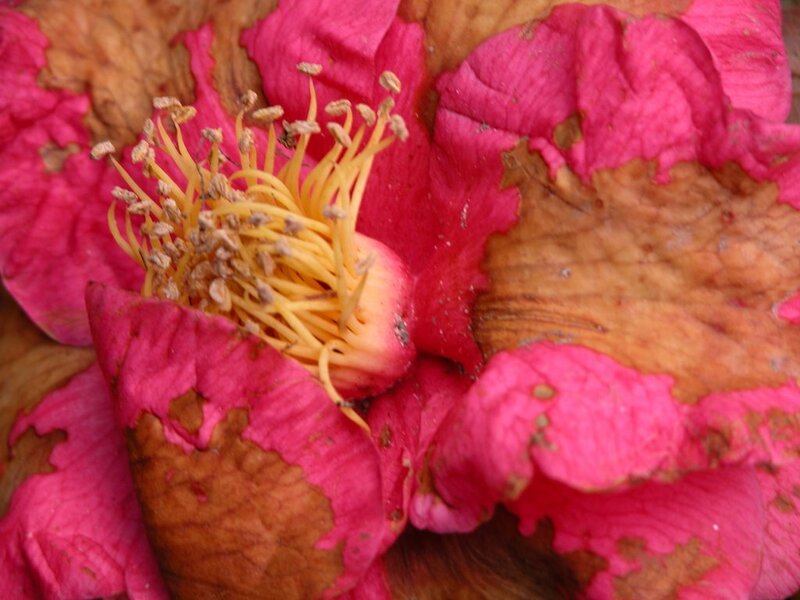 These trees are some of the first to bloom in Atlanta (they come before dogwood and azaleas), and their beautiful powder puff presences line highways and suburban neighborhoods…along with their grimace-worthy scent, the most courteous description of which is rotten eggs. There have been Bradford pears on my street since I was a kid (and lived on a street called Bransford, which afforded some confusion), and I’ll admit that I was glad to smell them—spring is at hand! Mom was very surprised and (I hope) pleased to see us. Hugs and gifts were exchanged (she gave me the new Food Network cookbook—does anybody have favorite recipes from it? ); then we piled in the car and went to Jalisco for lunch. Quite like your chicken soup and your cheese dip. O mystery concoction of white cheese! That melt away a dubious customer’s doubt! Will compliment the decadent cheese grub. When I think of comfort food it’s you I see! After lunch, we went to the grocery store and purchased ingredients for dinner, which J and I were preparing for the ‘rents. We got home, played Scrabble (at which we are fierce adversaries), lounged out in the garden in the sunshine, and started to prepare dinner, estimating my dad’s arrival from work at about 7:30. He, however, unaware of our visit, was busily mediating until past midnight…so we made the meal, ate it ourselves, and saved him a plate of leftovers. We went to bed, and mom passed off the dinner as her own attempt at a romantic dinner, which solicited profuse apologies from dad! Peel and core apple and cut into ¼-inch cubes. Melt butter in a 12-inch heavy skillet over moderately high heat until foam subsides, then sauté caraway seeds, stirring, 1 minute. Add onion and sauté, stirring, until softened, about 6 minutes. Add apple and celery and sauté, stirring occasionally, until crisp-tender, about 4 minutes. Remove from heat and stir in remaining stuffing ingredients. Cool stuffing completely. Pat chicken dry and arrange, skinned sides down, on a work surface. Remove tender (fillet strip on side where breast bone was) from each breast half if attached and reserve for another use. Beginning at center of thicker end of breast, insert a small knife horizontally, stopping about 1 inch from opposite end. Open incision with your fingers to create a 1-inch-wide pocket. Pat chicken dry and season with salt. Heat oil in a 12-inch heavy skillet over moderately high heat until hot but not smoking, then brown chicken in 2 batches, about 2 minutes on each side, transferring to a small roasting pan as browned (reserve skillet). Roast chicken in middle of oven until just cooked through, 14 to 16 minutes. While chicken is roasting, stir flour into fat remaining in skillet and cook roux over moderately low heat, stirring, 1 minute. Whisk in cider and broth and bring to a boil, whisking, then boil, whisking occasionally, until thickened and reduced to about 1 cup, about 8 minutes. Let chicken stand 5 minutes, then cut each breast half diagonally into thirds or fourths. 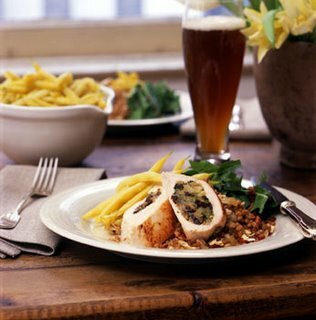 Add any juices from roasting pan and salt and pepper to taste to sauce and spoon over chicken. Combine spinach and 1/4 cup water in heavy large pot over high heat. Toss until spinach wilts but is still bright green, about 3 minutes. Transfer spinach to colander; press to release excess liquid. Heat oil in same pot over medium heat. Add garlic; stir until fragrant, about 30 seconds. Add currants and capers and stir 1 minute. Mix in spinach, then cheese and toss until heated through, about 1 minute. Season spinach to taste with salt and pepper and serve. A gold mine!!! I make sautéed spinach all the time—usually with either soy and sesame oil or red wine vinegar—and this is my new preferred alternative (although I left out the currants and threw in a tiny splash of red wine vinegar). The capers are a perfect addition. Sauté onion in oil in a heavy pot over medium heat until soft and golden, about five minutes. Add rice (rinse first, if desired) and stir until coated with oil and fragrant, 2-3 minutes. Add broth and however much additional water is needed according to package; stir in garlic, reduce heat and simmer until cooked, according to package. While rice is cooking, sauté almonds and currants in butter until almonds are just browning, about 2 minutes. Set aside. 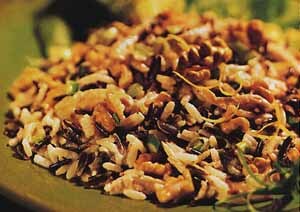 When rice is done, remove from heat, fluff, and gently mix in salt, almonds and currants, and parsley. Serve hot. We love this rice and make it often. It’s also delicious with sweet maple flavors instead of garlic and stock. My father was impressed by the meal, even in its microwaved form, which led to awkward re-distributing of compliments the next morning, when he found out who the real chefs were. The rest of our visit with Mom and Dad included a trip to Fernbank and a wonderful meal at Six Feet Under, which is across from Oakland Cemetery. Oh, seafood steamer and oysters on the halfshell, thy names are “exquisite” and “delicious”! Next, J and I drove to Winston-Salem, NC, to visit his sister Angela, who attends NCSA. 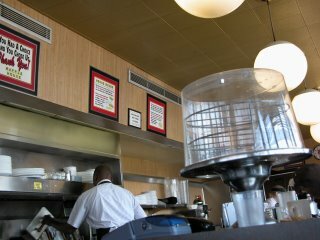 And on the way we dined at that emblem of Southernhood, that Mecca of calories…Waffle House. I busted out my high school algebra to figure out there are 129 combinations of ways to have your hashbrowns prepared (and that’s without doubles and triples!). 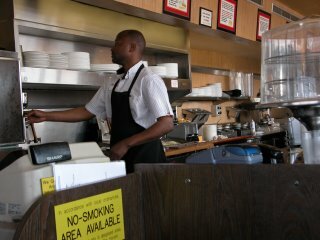 No pie in the pie stand today, but usually there’s nothing I wouldn’t give for a slice of Waffle House Chocolate Icebox Pie. Once a Waffle House staff guy let me have his WaHo visor. Sweet. 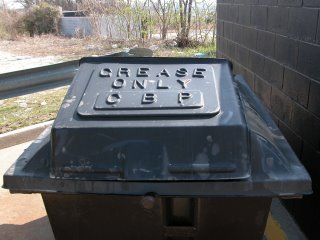 Its contents: 400 gallons of grease. 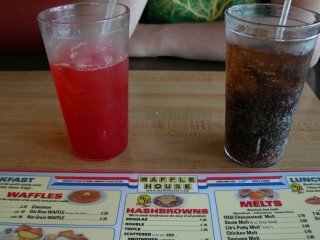 I love you, Waffle House. However Yankee I may become, IHOP will never be thy superior. You aren't going to write about the delicious cake we shared? Teehee! Yea! How nice to relive your special visit. 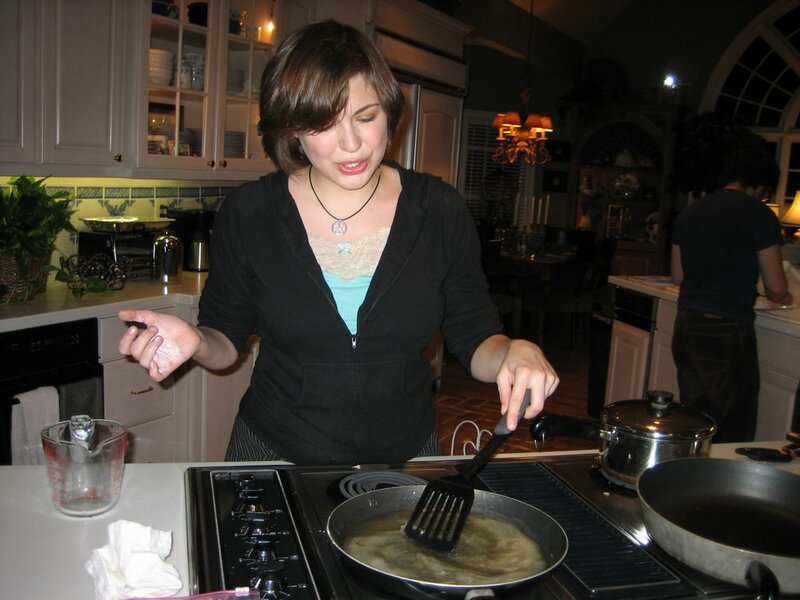 I am here to tell each of your readers that you and your singing, sous chef, made an absolutely fabulous meal and again expanded my exposure to the pure enjoyment of good food. 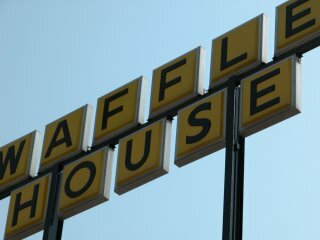 My father would have been proud that you share his love for Waffle House. I never understood it, but it was his favorite...as for "Ode to Jalisco", I am so going to hand deliver a copy to them! You know it will be framed and hanging on the wall the next time you dine there. Hi Kate, what a great post! My girlfriend and her family recently moved to Atlanta since her husband's a pilot with Delta, they seem to really enjoy it there. I'll have to visit them one spring to smell the Bradford Pear Tree blossoms!